The Dalite Model B 70 x 70" Manual Projection Screen is a big package in a small, affordable and efficient screen. For the office, school, business or meeting facility that needs a simple and reliable pull-down style screen, the Model B is hard to beat. With a gentle pull on the enclosed cord, the screen rolls down smoothly - and retracts with the same ease. Much like the school screens of years ago, this model is for those who need a strong and rugged "pull-down" type surface with none of the bells and whistles of more sophisticated, electronic models. Dalite, a more-than-known name in the audio-visual field, has screens for every projection environment and office need. Their long-standing reputation for form, function and price make them a leader when you are shopping for audio-visual equipment. Box Dimensions (LxWxH) 79.0 x 5.0 x 5.0"
40188 Model B Manual Projection Screen (70 x 70") is rated 4.7 out of 5 by 11. Rated 5 out of 5 by Technical1 from Solid Performer Being an AV technician for a school district for 30+ years, I have recommended Dalite screens for use in our classrooms. It's hard to get excited over projection screens, but Dalite has provided us over a thousand consistant, well performing screens, so I know when we order another, it will be reliable. We order the matte white screen fabric which can be cleaned with a damp rag. You can also buy a version that has glass beaded fabric which provides a brighter image. For us, the glass beaded fabric isn't as attractive because it can be more easily defaced - especially in a classroom environment. 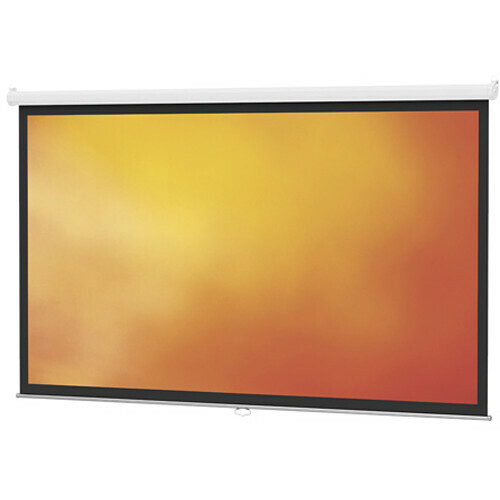 Rated 5 out of 5 by ScienceTeacher from Works great for education I am an educator, teaching in a 50' x 31' classroom/lab with a Sharp Notevision XR-10X-L DLP projector. This screen is large enough to run my PowerPoint presentations and to show videos, even with the windows open, although I have to turn off half of the lights.Mounting the screen was easy once I had the T-bars clamps installed on the drop ceiling. Installing the T-bar clamps was a bit difficult and dirty. (Ever seen what is on the other side of your drop ceiling? It ain't pretty. )The screen retracts reliably as long as you follow the instructions, which are helpfully printed on the pull handle.The combination of good performance, low cost, and free shipping makes me wonder why anyone would pay more for a comparable product. Rated 3 out of 5 by Lurabbia from Doesn't slide back into its case I like everything about this screen BUT it doesn't slide back into its case. I exchanged the first I purchased thinking that it was defective but now I am having the same issue with the new one. At beginning I blamed myself but also my friends are not able to slide it in. So, I do not know. Everything else about it is great. Image looks sharpe and brilliant. Rated 5 out of 5 by Anonymous from Great screen for the price! Easy to use, set up and great picture. Although Da-Lite doesn't tell you the 'secret' way to get the screen to roll up if it does get stuck all the way open. Basically, pull screen down and forward (towards you) and then push it up at a quick controlled rate. I discovered this on a YouTube video. Rated 5 out of 5 by Pam with the Plan! from I would buy this again We use this in our agency conference room to do education for our clinical staff for electronic medical charting. We mounted it right over a large picture on the wall and simply pull it down whenever needed. Rated 5 out of 5 by Pastor B from Great value - clear picture We bought this screen for a church classroom. The screen was easy to install, a great size for the price, and helps provide a great picture when used with our video projector. Rated 5 out of 5 by Anonymous from Great Screen at a Bargan Price We are using this screen in our parish hall for meetings,training, and entertainment. ... great condition. It was easy to install and works well.